This summer Tom and Kitty Latane will teach classes again at Gary Hill's blacksmith shop Raspberry Island on Big Sandy Lake, north of McGregor. He has some opening for the classes. Norwegian knife maker Kjetil (KJ) Groven coming to teach how to make traditional 3-layer Norwegian knifes with sheath. Please contact Gary Hill (hillx001@umn.edu) for additional information. Tom Latane will be teaching a three day class on Making a Norse hatchet with tapered socket eye. Students will work in pairs striking for each other to produce an axe with a tapered socket eye for each participant . The design is a modification of a pattern developed by Håvard-Bergland to reproduce a 17th century battle axe belonging to his family. 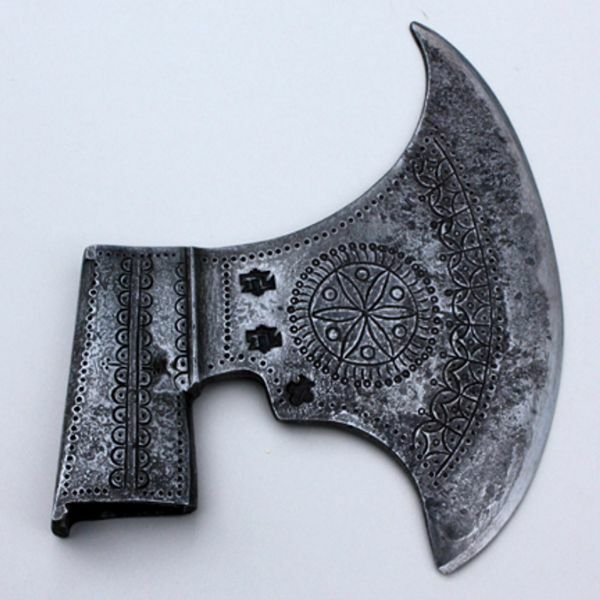 The battle axe would be an alternative option to the hewing hatchet. The socket will be forged from 3/8" x 4" stock and the forge welded socket will be welded to the blade (1/2" thick) with a high carbon bit welded in place. (some experience forge-welding would be helpful). Axes will be pickled in vinegar, filed, and punch decorated (if desired) before hardening and tempering. Course fee: $225 plus materials fee. Limited to 12 students. 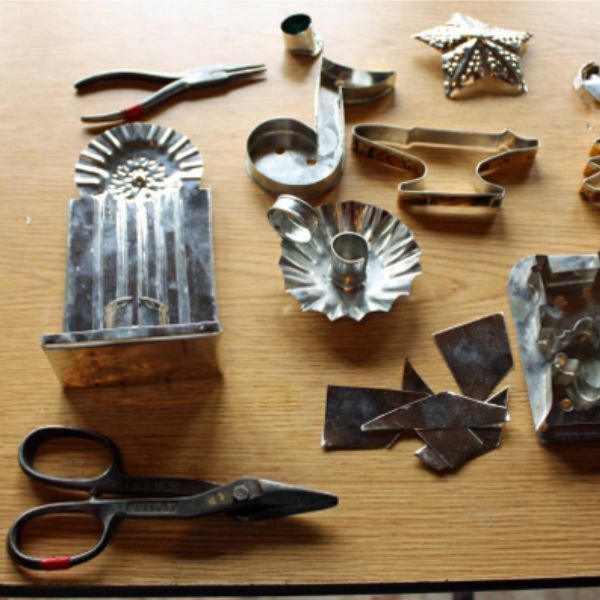 Kitty Latane will be teaching tin smithing classes on the same dates as Tom's class. Projects will include such things as cookie cutters, cups, ornaments etc. Course fee: $75/day (includes all materials and tools) Limited to 6 students. In this 3 day class, we will forge traditional Norwegian 3-layer knife blades. The blades will be heat treated and ground. Next the blade will be set in a wood handle shaped and stained. 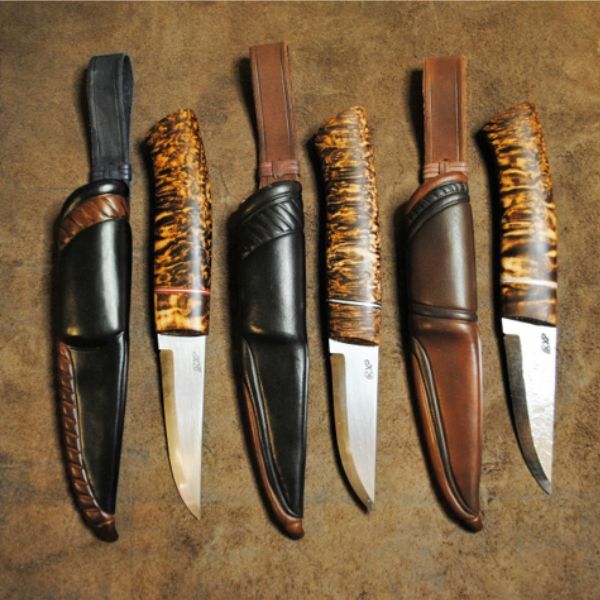 If time allows, a traditional leather sheath will be made, but if not, all the steps to making the sheath will be demonstrated so that students can finish the sheath on their own, if needed.